EA President Frank Gibeau thinks that the next C&C can be built to fans' demands. When it was revealed that Command & Conquer: Generals 2 would lack a single-player campaign, the decision was met with disapproval from series fans. After all, the hallmarks of the franchise include its plot-driven missions and extra cheesy FMV cutscenes. In a bid to keep the peace, Electronic Arts has announced that a single-player campaign for the game (which is now rebranded as Command & Conquer) is not totally out of the question. Frank Gibeau, president of EA Labels, explained the situation in a recent interview. "Our intention with Command & Conquer is to create a triple-A experience, and by that I mean we're using Frostbite tech, we're using very high-end graphics. "Does that mean it's not going to have single player? No, that's something we've obviously heard loud and clear that is important to people," he says. "The beauty of free-to-play is that we can adjust and adapt to what we're hearing as opposed to, 'I'm sorry, it's two months from ship and it is what it is.' It's a very different model because you don't have to build as much. You build in response to your audience." 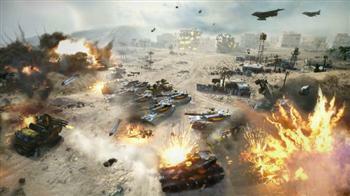 Command & Conquer is expected for release in 2013.